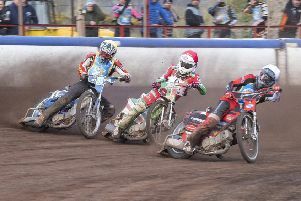 Edinburgh Monarchs’ 18-year-old star Max Fricke has won a third-successive Australian Under-21 speedway title at Kurri Kurri. The talented teenager had to recover from a fall when he was brought down by rival Jake Allen in the A Final showdown which took three attempts to run. Allen was excluded from the rerun for his actions, leaving Fricke to fend off a fierce challenge from runner-up Jack Holder and Brady Kurtz before claiming glory. Fricke said: “It hasn’t got any easier to win (the title) because everybody seems to get better each year. After my tumble I had to jump on my spare bike for the rerun and thankfully everything worked out well for me. To win three on the trot is pretty special.” Fricke is only the fourth rider to achieve a hat-trick of victories in the event and could emulate the record four wins by Chris Holder, who managed the feat in 2007.